The leaves are falling and winter will be here before we know it! It’s that weird in between time, when it’s chilly, but not quite chilly enough to go full on bundle up in your down jacket and fur lined boots. 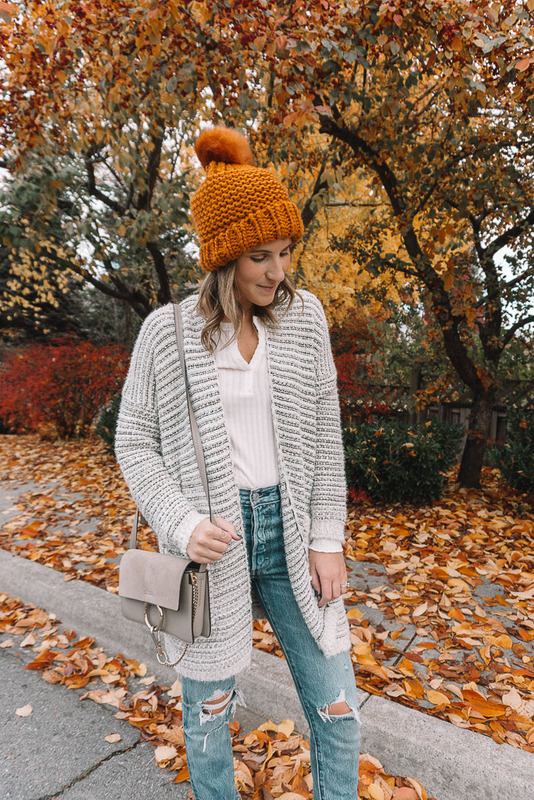 This time of year, I rely on cute but cozy accessories to layer up my fall looks! My two favorite fall accessories? Beanies and scarves! Sharing not one, but two looks today on how I incorporate them into my fall wardrobe! 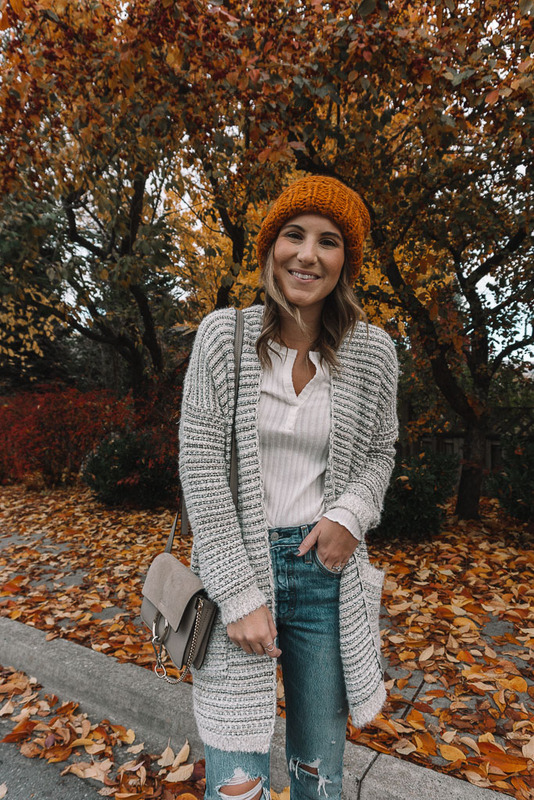 While shopping for a seasonal wardrobe refresh at Nordstrom, I couldn’t help but eye the accessories…my favorite part of dressing for colder weather! I love all of the beanies, floppy hats and scarves this time of year! The Nordstrom trend section is ALWAYS the first place I check for their amazing prices and great selections. I love finding the seasons best trends and classic closet staples all in one place! When it comes to scarves, I go for a couple of different options to mix and match with my wardrobe for the temp changes. 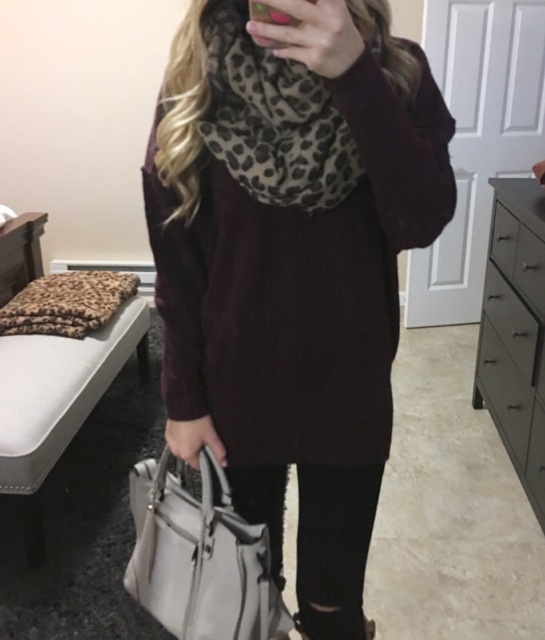 I love a good printed blanket scarf to pair with my neutrals. This one is cozy, but lightweight enough that I can wear it to work all day without overheating (it also comes in black)! A chunky knit scarf is also a must for those colder fall days. This ribbed option is oh so soft and perfect for wearing now and into winter (this one would make a great gift)! A beanie is my number 1 fall and winter staple. I feel like I am constantly throwing one on when I head out the door during the fall and winter. I love that a beanie can keep me nice and toasty during the winter, or be the extra bit of warmth I need in the fall when I am just wearing a sweatshirt! I couldn’t turn this one down because it is my favorite color for fall. It comes in 4 great colors and is SO warm! Are you a fan of fall and winter accessories? What is your go to? PS scarves and hats are the ultimate gift for your cozy loving mom, sister or bff! Shop some of my favorites below! Today’s post is in collaboration with Nordstrom. All opinions are my own! The weather here has been pretty mild for Fall, but last week the temps finally dropped and it has been frigid. It’s officially sweater weather! I’ve spent the last month or so stocking up on cute and cozy sweaters and am excited to finally start layering them with long sleeves and scarves! I decided to round up some of my favorites for you, but pardon the picture quality! Whether buying for yourself, or for someone else (all of these would make perfect Christmas gifts! ), these are the sweaters you can’t miss out on this season! 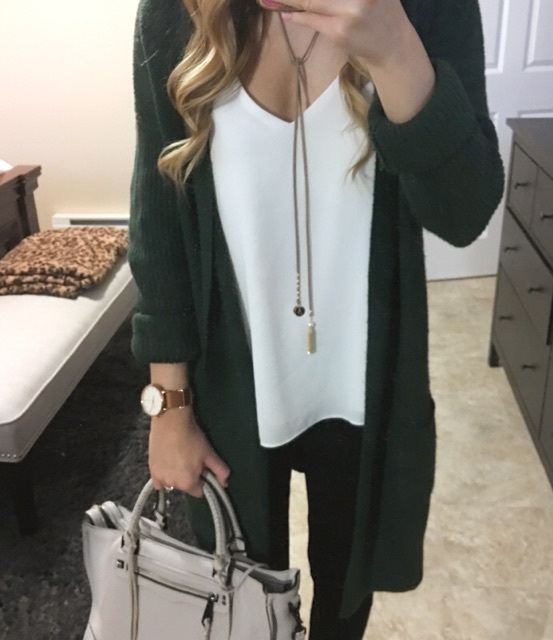 This cardigan is a MUST HAVE. The moment I got it and put it on, I immediately ordered it in grey…it’s that good. It’s the perfect weight and has just the right amount of stretch. It’s really soft and I love the length. Overall, this is the ultimate cardigan! It’s currently out of stock in this color, but check back. They just restocked the grey! 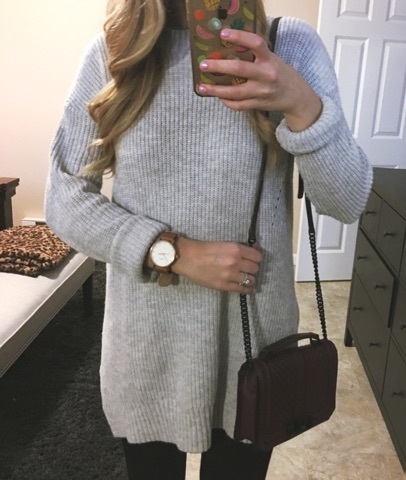 I have this sweater in 2 colors and they are both on heavy rotation. It’s one of those sweaters that is just the right length for wearing with leggings and over the knee boots. I also love the high crew neck, making it perfect for layering with long sleeve shirts. It comes in multiple colors and is just $40. Get one for yourself and your BFF! If you follow me on instagram (@twentiesgirlstyle), then you have seen this sweater one too many times. 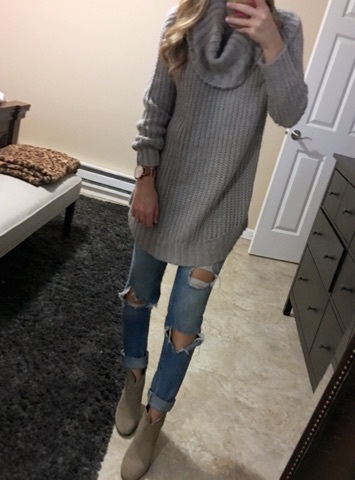 If you like oversized, then this is the sweater for you! It’s SO soft and comfortable and I love the soft blush shade! 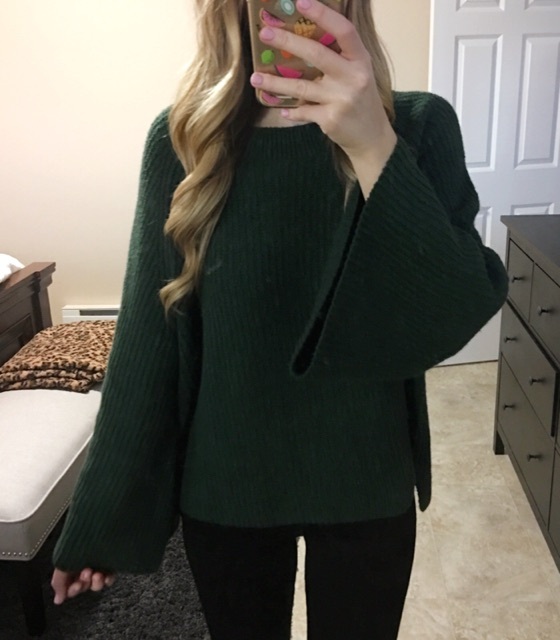 I’m wearing a small/medium, and it is extremely oversized, but if you like cozy, this is the sweater for you! 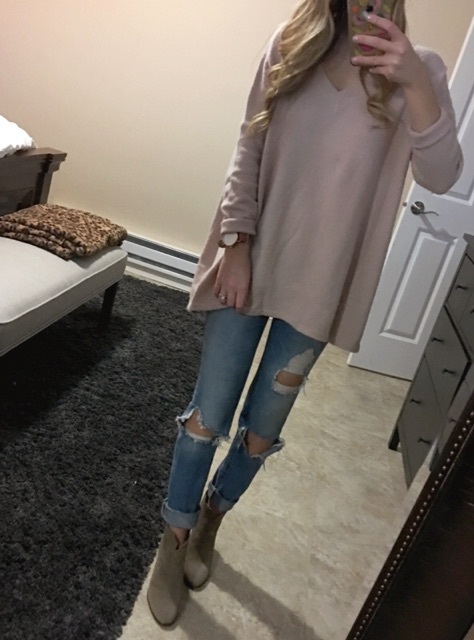 This sweater was one of my favorite purchases last year, and continues to be one of my favorites this year! I am excited that it’s currently back in stock in multiple colors and under $30, making it a perfect gift! I frequently wear mine with leggings and over the knee boots (as seen here). 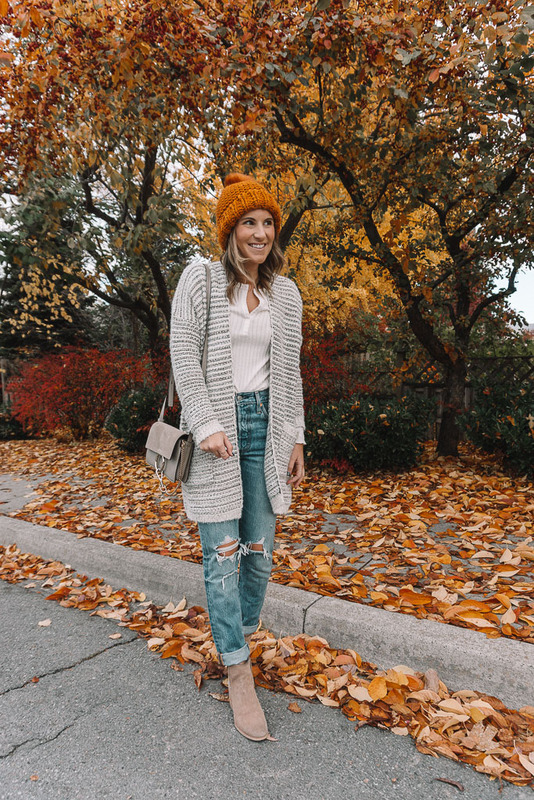 I am loving everything bell sleeves this fall and this cutie is the perfect trendy sweater to add in to my fall outfit rotation! It also comes in the most perfect rust orange, which I am also currently obsessed with! This is the perfect sweater to gift to your trendy sister! This is the ultimate cozy sweater! You can’t tell in the pictures, but this shade of burgundy is gorgeous! It also comes in black and a sweet blush. This is a wear with anything and everything sweater. I love pairing it with my favorite leopard scarf(another fabulous gift). 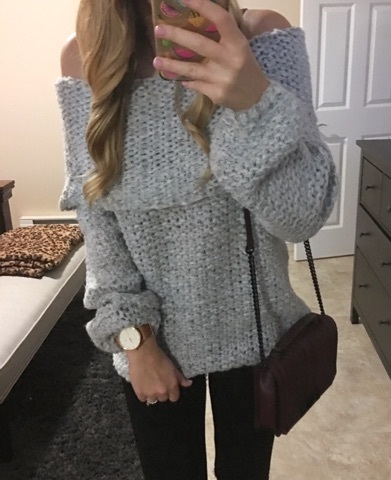 I’ve decided every girl needs an off the shoulder sweater this season! This one is currently out of stock, but I promise I will let you know when it gets restocked because it is fabulous! An off the shoulder sweater can easily be dressed up or down, which is perfect for the holidays. Wear it to hang out with the family and bake Christmas cookies, or wear it out on New Years Eve! This is my first post where BOTH pieces in my outfit are from Shein! I have had a lot of people ask me about the quality of Shein clothing and I have to say that I have been impressed! Look for a Shein review post coming soon with my tips and tricks for shopping the site! 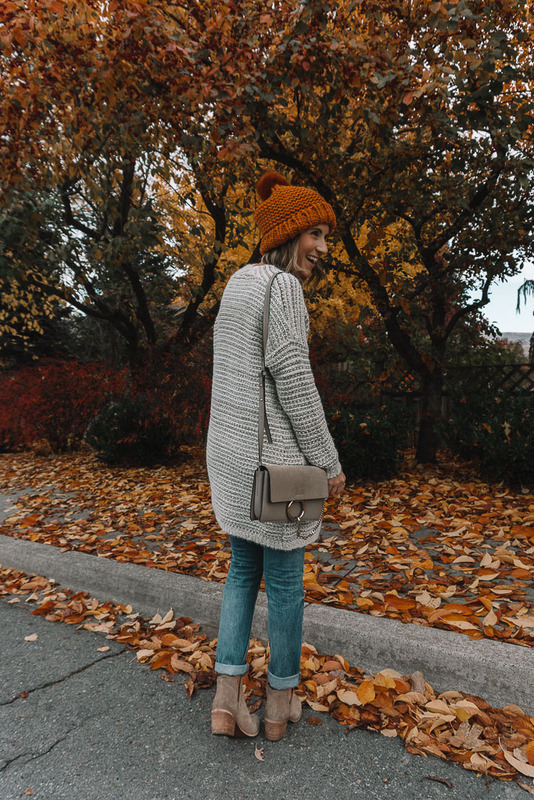 This is an outfit that is so easy and cozy for fall. 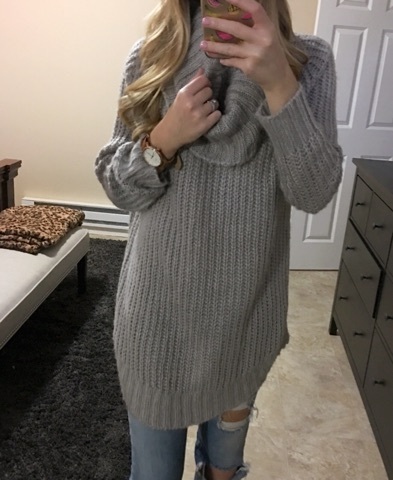 I love this chunky knit sweater that is SO warm! I can definitely get away without a coat when wearing this as of now! I have a similar tunic (here) that I got this spring and paid quite a bit more for. I love that this option allows me to get that same look for less, and it’s the perfect fall floral! Happy Wednesday! I have to apologize for a lack of posts lately! From being sick, to having the internet down, it’s been an interesting few weeks! We finally got our internet back up and running, but last night I got home late from work and could not keep my eyes open long enough to get a post up. Can anybody relate?? If there is a trend I am obsessing with this fall, it’s capes and ponchos! No better way to stay warm, as it’s like wearing a blanket all day only far more acceptable to wear out in public! This option from SoCal Gems is perfection. 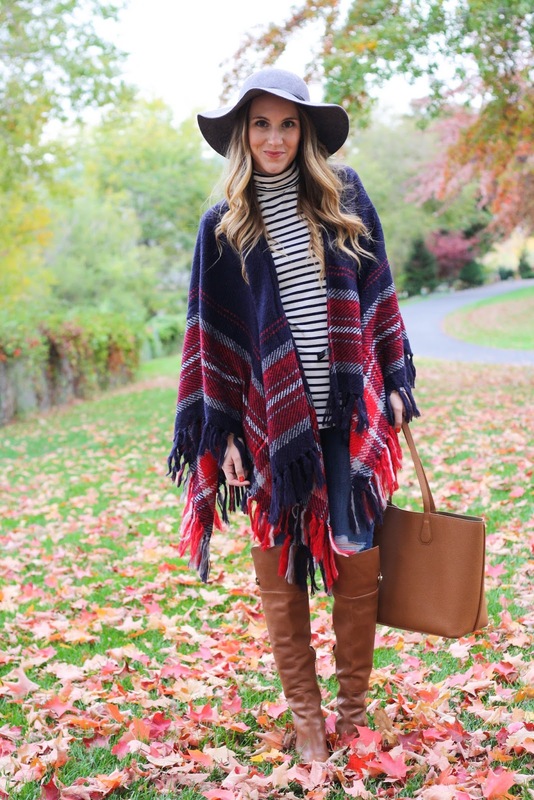 The plaid and fringe are the perfect combo!! Of course, sticking with my current theme, I paired it with stripes. But really though…is there any better pairing?? I am really loving all of the scarves and poncho options SoCal Gems currently has in stock! I love that they are affordable options and great quality! If you are craving a poncho, or a great plaid scarf, definitely check them out!